Faculty supporters of an academic boycott of Israel are "disproportionately affiliated" with just three disciplines, according to a new study by a watchdog that monitors anti-Semitism on American college campuses. Of the nearly 1,000 pro-boycott professors included in the AMCHA Initiative study, 70 percent were associated with gender studies, ethnic studies, or Middle East studies. More departments, centers, or institutes in those fields are led by "faculty boycotters"—or those who have signed at least one of the approximately 20 publicly available statements in support of an academic boycott of Israeli scholars and institutions, as part of a movement known as BDS (boycott, divestment, and sanctions)—than in any other discipline, according to the report. Half of the faculty boycotters whose primary scholarship was not in gender, ethnic, or Mid-East studies were found to have "secondary affiliations" with one of those fields. Those departments saturated with pro-BDS faculty were subsequently far more likely to bring BDS-supportive programming to campus than their counterparts with no boycotters, wrote AMCHA. Gender studies units with one or more pro-boycott lecturers were 12 times more likely to sponsor such events than their counterparts with no pro-BDS professors, a starker contrast than that found in either ethnic or Middle East studies, according to AMCHA. Middle East and ethnic studies with pro-BDS faculty were five and 10 times more likely, respectively. Overall, close to 90 percent of anti-Zionist or pro-BDS programming is brought to campuses by departments, centers, or institutes associated with gender, ethnic, or Mid-East disciplines, wrote AMCHA. According to the watchdog, a straight line can be drawn from the number of pro-BDS faculty to the volume of BDS campus programming, to the extent of anti-Israel expression among students, to the amount of anti-Semitic activity at a university. A full 68 percent of the 183 acts "that targeted Jewish students for harm" in 2015 and 2016 occurred on campuses where ethnic, gender, and Middle East studies departments sponsored pro-BDS events, wrote AMCHA. Almost all of the incidents occurred at schools that had seen at least one incident of "anti-Zionist expression" by students. Tammi Rossman-Benjamin, director of AMCHA and a Hebrew lecturer at the University of California-Santa Cruz, said, "It hits you between the eyes. There is no way these results are by chance or randomness." She conducted the study with her AMCHA co-founder Leila Beckwith, a professor emeritus of pediatrics at University of California-Los Angeles. Rossman-Benjamin said she and Beckwith began with the "informed assumption" that BDS faculty would be concentrated in these three fields, but objectively determining that fact and its effects was still "overwhelming." "Whole disciplines have started accepting, as a starting point, that Israel is an illegitimate, apartheid settler-colonialist state," said Rossman-Benjamin. 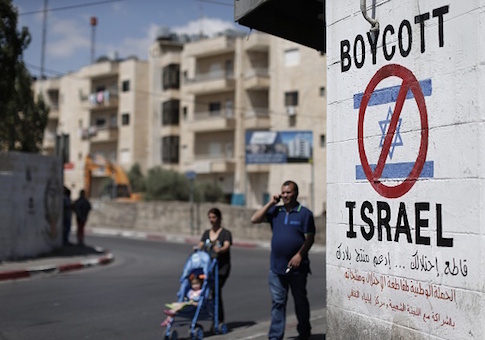 "When BDS becomes a social-justice issue, it becomes the norm." AMCHA found in its 2015 and 2016 annual reports on anti-Semitism at U.S. campuses a general association between faculty boycotters and "a significant increase in the likelihood" that those campuses will see anti-Jewish activity. Having spent six months researching over 500 departments at the 113 American colleges with the largest Jewish populations, Rossman-Benjamin believes this is the first study to break down the numbers behind that correlation. Rossman-Benjamin recognized the study has several pitfalls, not least of which being the researchers' inability to track any non-public activity by faculty of academic departments. Assessing the crucial factor of faculty implementation of BDS in the classroom, and in interactions with students and colleagues—such as railroading study abroad programs with Israel, or refusing to write a recommendation for a Zionist student—was mostly beyond AMCHA's reach. When examining public departmental or faculty activities, primarily the programs co-sponsored, Rossman-Benjamin said, "In two-thirds of the cases, we couldn't determine content." "But, in the one-third that we could, the content was anti-Zionist. In almost no cases was the program with a BDS supporter set up as a debate," said Rossman-Benjamin. Rossman-Benjamin called on the university community to recognize the "long-term harm of the boycott narrative taking hold of academia." "It does real damage to all of us, to the whole academy, not just to Jews, when faculty boycotters run whole departments and own the campus conversation on such important, prominent issues as the Middle East, world peace, international relations," she said. Rossman-Benjamin said she is unequivocally against violations of academics' or students' free speech rights and does not advocate administrative intervention in stopping pro-BDS events from happening. "But we need to recognize what is going on," she added.